The Law Office of Caryn H. Nguyen provides a wide array of legal services for our clients. Attorney Caryn H. Nguyen has over fourteen years of experience as a general legal practitioner with a focus in personal injury claims, family law cases, business formation, contract negotiations, and estate planning. Ms. Nguyen takes pride in being a zealous advocate for her clients while representing her profession with integrity. She understands each case requires an individualized approach to getting the best result for her clients. Our goal is to work with you to come up with the best approach to handle and resolve your case. Our firm is committed to providing quality legal services and building long-term relationships with our clients. We value the trust you place in our office to handle your legal matters. We strive to maintain that trust by being responsive to your questions; working with you to understand your needs and goals; keeping you informed of your case; and treating your matter with the excellent care, attention to detail and professionalism that you deserve. Whether you have been injured through someone's negligence, going through an emotional divorce, looking to form a business, or create an estate planning plan, we are dedicated to helping you get the results you want. Let us take care of your legal needs. 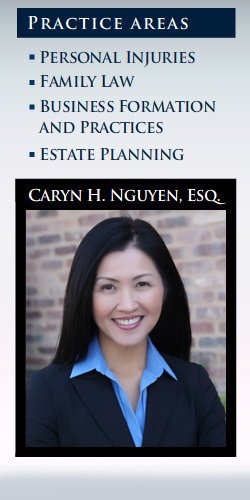 Home | About Caryn | Practice Areas | Office Location/Directions | Testimonials | Contact Us/Office Hours © 2014 Law Office of Caryn H. Nguyen. All Rights Reserved.